As Montgomery AIDS Outreach prepares for its annual fundraiser, I am reminiscing about MAO’s beginnings 25 years ago. In the mid 1980s, I watched with great concern the national news about the health crises in big cities and began to worry about my gay friends. The Montgomery Advertiser boldly published a feature about the crisis and based the article mainly on an interview with an openly gay friend of mine, Lawrence. (I’ll use first names only, but you know who you are.) I called him to support him on his gesture, but I wasn’t the only one. Many others had also expressed their concerns and Lawrence invited everyone to his apartment in Winter Place located on Goldwaite Street. At that first gathering, there were about a dozen people from all walks of life — a doctor, a nurse, a CPA, a lawyer, and many of us just interested folks. We continued to meet each Monday night, creating a strategy to prepare our community for what might be ahead. We contacted the organizers of Birmingham AIDS Outreach who assisted and guided us. We felt so connected to them that the official name, Montgomery AIDS Outreach, seemed nonnegotiable. Rick drew up and filed incorporation papers and Montgomery AIDS Outreach became an official non-profit organization. Sandra was elected the first president and I was the treasurer. With a check for $100 from a local businesswoman whose nephew had passed away from AIDS, we opened our first bank account. The local night club had started holding fundraisers, donating all the tips to MAO. I went into the main downtown bank with our first check and a Tupperware bowl full of cash and told the dumbfounded banker who and what we were. He remained an ardent supporter for years to come. The support from these fundraisers was the main initial source of our direct aid for providing bags of groceries and medications, as well as gas for doctor’s visits. Our first official client was R., who was from Montgomery and had returned home with no health care or support in the advanced stages of AIDS. The volunteers from MAO rallied in R’s care with food, transportation, housing and friendship until he passed away. More and more inquiries and pleas for assistance began to pour in. We began to have weekly educational forums at the County Health Department on West Jeff Davis Street. The audience became the “volunteers” and the programs became “training sessions.” Our speakers talked on all AIDS-related issues: health care, social services, nutrition, research, mental health. The audience grew as more and more people began to know someone affected by the disease. As public money slowly became available, MAO acquired its first director. Jackie, a retired nurse from Selma, was hired and her medical knowledge, office skills and people personality won us all over immediately. She brought MAO into the public eye as a professional medical support organization with a definitive mission and huge task ahead of it. And she was a fantastic grant writer! With the passage of The Ryan White Comprehensive AIDS Resources Emergency (CARE) Act in 1990, the largest federally funded program for people living with HIV/AIDS, MAO has been able to expand programming and services over the years. Ryan White was an Indiana teenager who contracted AIDS in 1984 through a tainted hemophilia treatment. He was subsequently expelled from school and became a hero for AIDS research and awareness until his death. Today, MAO operates a fully staffed professional clinic, which it owns, and offers a plethora of programs to over 1,000 clients in 26 surrounding counties. 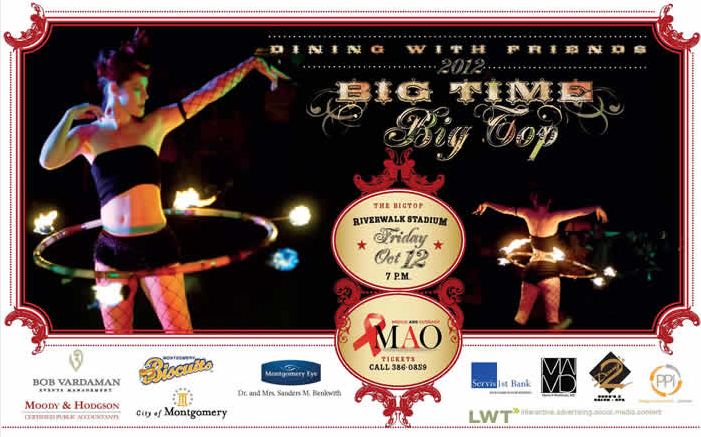 I have my ticket for the upcoming “Big Time, Big Top” annual fundraiser at Riverfront Stadium on Friday, October 12 where I will be, once again, dining with friends!